Today will stay in Dieter Van der Eyken’s (Starboard / Severne) memory for the rest of his life after the Belgian maestro defeated teammate and friend - Amado Vrieswijk (Starboard / Severne) - twice in the second double elimination to claim his inaugural event victory on the PWA Freestyle World Tour after a scintillating display. 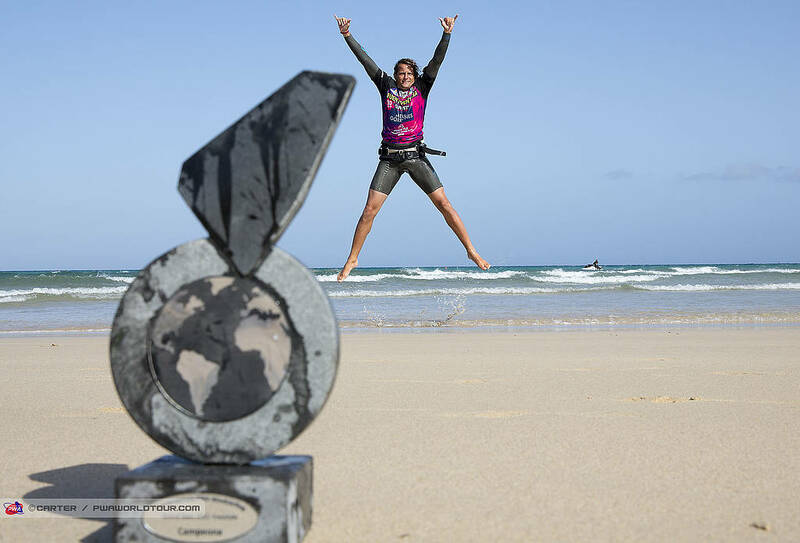 Meanwhile, Sarah-Quita Offringa (Starboard / NeilPryde / Mystic / Maui Ultra Fins), continued to sail at her imperious best to be crowned the 2015 PWA Freestyle World Champion - which is the Aruban gems 8th successive world title. Dieter Van der Eyken is without a doubt the man of the moment after claiming a thoroughly deserved victory, which is the first time he has stood at the top of the podium. Van der Eyken came into today leading the event, but as Kiri Thode (Starboard / GA Sails) started to storm back through the double the rankings changed and not in Van der Eyken’s favour. The Bonairean was on fire today as he defeated Antony Ruenes (Tabou / GA Sails), Tonky Frans (Tabou / GA Sails / AL360), Philip Soltysiak (Starboard / Sailworks), Davy Scheffers (Tabou / GA Sails) and finally Nicolas Akgazciyan (99NoveNove / Point-7 / Maui Ultra Fins) with trademark air bobs, stunning kabikuchis and clew-first backloops. This moved Thode into third place in the double elimination and meant that Van der Eyken would now need to win the elimination to win the event. Van der Eyken and Thode faced each other in Heat 50 in what was one of the biggest heats of the day. If Thode advanced he would be the champion, but if the Belgian could claim victory his dream of winning the event would still be alive - so both sailors had plenty on the line. Thode has been on fire, but Van der Eyken was clearly pumped up and came out sailing like he was on another planet. The Belgian landed an explosive culo before landing an incredible air skopu and from here he continued to land his whole repertoire of moves with spock into culos, kabikuchis and a massive shaka too. The verdict was soon given that it was Van der Eyken who advanced and Amado Vrieswijk was waiting next. Van der Eyken sustained his incredibly high level in the winners’ final against Amado Vrieswijk, whilst his Bonairean teammate didn’t quite find his groove after making a brilliant start to the final with a ridiculous air kabikuchi. For one reason or another Vrieswijk couldn’t build upon the good start whilst Van der Eyken went from one level to the next as he again exploded through an extensive repertoire of mind-blowing moves. It was soon revealed that the event would be going all the way with Van der Eyken winning to force a super final. The Super Final was the biggest heat of Dieter Van der Eyken’s career and he would have been forgiven for seeming nervous, however the Belgian held himself together admirably, but at the same time Vrieswijk also found his form. After having a few minutes to regather his thoughts on the beach, Vrieswijk, again came flying out the starting blocks with another ridiculous air kabikuchi and a clean skopu. In the meantime, Van der Eyken, rotated through a perfect spock culo and a stylish one-handed burner 360. Unfortunately for Vrieswijk he then landed a kono outside for the contest area, which cost him dearly with only 3 moves to count of port tack. This swung the advantage in Van der Eyken’s direction and he duly obliged as he ended the heat with a shuvit spock to reign victorious. Phil Soltysiak was in fine form today as he won four consecutive heats. The Canadian first dispatched of Nic Hibdige (Tabou / GA Sails) before going on to beat Nick van Ingen (Fanatic / North / Maui Ultra Fins). Soltysiak was then involved in an incredibly close heat with Taty Frans (Starboard / GA Sails / Mystic), with the latter originally being given the verdict. However, Soltysiak’s opening move had been adjudged as a skopu, which was incorrect and as a result the result was over turned. Soltysiak then faced another Bonairean in the shape of Youp Schmit (99NoveNove / Avanti) an it was another close heat with both sailors on fire. The verdict again went in the Canadian’s favour as he advanced by way of a 2:1 decision after landing sick skopus, smooth burner 360sand a spock culo. Next up for Soltysiak was Thode and the duo endured another hard fought affair that again went down to the wire. Soltysiak came out with all guns blazing as he landed another sick spock into culo and a radical skopu 360. After much deliberation from the judges it was revealed that Thode had won by way of 2:1 decision - with the final scoresheet having just half a point difference. Antony Ruenes sailed through the pain of his foot injury today as the Frenchman bravely battled his way through two heats - but actually had to sail 3 times due to a missed move much to his displeasure. However, in the resail of Heat 38b, Ruenes came out on top at the second time of asking to defeat Max Rowe (Fanatic / North) before also advancing past Bjorn Saragoza (Starboard / Hot Sails Maui) as he turned on the style with smooth regular chachoos and super technical one-handed, clew-first flakas, whilst also shouting in pain. The usual suspects of the past five days appeared in the last winners’ final of the event as Oda Johanne (Starboard / Severne / Maui Ultra Fins) again lined up against Sarah-Quita Offringa. The now eight-time world champion already had the 2015 world title wrapped up, but as always delivered a flawless performance consisting of a floaty shaka and a rapid air flaka before also rotating through a sick culo, burner and a regular kono to show off her latest power moves repertoire. The Queen of freestyle also attempted a spock culo, but couldn’t pull it off on this occasion. Her Norwegian opponent also sailed well as she landed a great shaka 360, planing flaka and came agonisingly close to stomping a burner. However, there was nothing Johanne could do to prevent Offringa from claiming another emphatic victory. Johanne though will be delighted with her weeks work as she takes home the title of the 2015 PWA Women’s Freestyle Vice-World Champion. Maaike Huvermann (Starboard / Severne / Maui Ultra Fins) sailed superbly again today as she took home third place in the third double elimination, which secured her spot on the heralded podium for the second year in a row. The seventeen year old has improved significantly over the past year and she will be an even bigger danger next year and in years to come. Fuerteventura once agin delivered the goods to allow five frantic days of freestyle, however the attention now turns to the race course as the world’s fastest sailors prepare to battle it out in the howling winds from tomorrow onwards. The skippers’ meeting has been called for 10am with the action commencing from 10:30am. Make sure you tune into www.pwaworldtour.com to follow the warp speed slalom live with Ben Proffitt. Antoine Albeau (RRD / NeilPryde) currently leads the way, but will he still be leading come the end of the next five days?